In a previous article about deloominator, I explained why I choose Go from a product perspective. In this article, I want to share my experience with Go as a developer. I had many “unfinished conversations” on Twitter about the topic, and I promised I would find the time to write about it. Most of the criticism around Go I run into lacks depth and makes me think people have never got past reading a few lines of Go. I’ve often felt out of place among developers discussing programming languages. My experience is that few developers care about some of these areas and the big majority care about language features only. Of course I also find language features relevant, but to me they are only one aspect of a much broader conversation about the workflow experience. It lets you query mysql or postgres databases from a web interface. It saves “questions” (a query with its results) into a database for later reference. As the UI of the application is a single-page React application, these features are exposed via an HTTP server. deloominator is still in its early days as a product, but, while working on it, I’ve been exposed to the language long enough to form an opinion on the aspects I consider relevant. Official Go documentation is really good. I almost never have to search the web – the official docs are enough. As I use the superb Dash for browsing documentation, I can learn just with dash and the editor. There is little context switch. Being able to run examples right there is helpful, I use the feature when I’m not sure I understood the docs. The first steps with a new language are always a bit cumbersome, because I don’t know what is idiomatic and what is not. Before getting into deloominator, I was only toying around with Go. This was my first “big” Go project and effective go was vital for me at the time. I’m not sure if the name of the document is inspired by the wonderful Effective Java. Either way, the result is the same: I constantly went back to it as the ultimate source of inspiration for writing code. If you’re relatively new to Go and want to learn more, “effective Go” is a perfect companion for your journey. In general, there is a strong documentation culture in the Go community and I couldn’t be happier about it. I experience a direct correlation between languages and the kind of testing I can write. That’s why I call it “testing experience”; writing tests is more than just tooling. I’m too old to ignore the maintenance cost, so I’m happy the standard library goes a long way. One little feature I miss is the lack of colors in the output, but that’s a personal nuance. Go tests tend to make a heavy use of table driven tests and the approach fits well with my way of thinking about tests. Advanced tests often use golden files that help to check complex output. The combination of golden files and table driven testing is what I like the most about writing tests with Go. It’s easy to cover a bug fix or to add another test case for a new feature. A good explanation of my preference is out of scope of this article. It is sufficient to say that my own preference troubles me, because I can’t easily write reliable and fast integration tests in many languages. deloominator integration tests are fast and reliable despite doing a lot of things. One example is how deloominator handles tests for SQL dialects: each test creates a new database and a schema using a template, loads some data, and finally asserts something. Each of these tests creates its own world; there’s no sharing and, therefore, they can safely run in parallel (speed!). I would have never done it this way in a different language and, in this case, it came naturally. Writing tests that achieve my preferred level of isolation and integration is easy, fast, reliable. Because of these factors, I enjoy writing tests in Go more than in any other language I worked with in the past. The tests I write give me a great deal of confidence which is a driving factor of the “workflow experience”, the aspect I’m discussing in the next paragraph. The everyday relationship I have with the language, the combination of tooling and language features is what I call “workflow experience”. Let’s start with the tooling: Go provides great basics for everything but dependencies. While I’m happy to see an amazing team doing amazing work on dep, the current status isn’t great for such a recent language. I vendor everything via govendor and it works. But I have to read docs every time I use it. Now, I’m sure one could say “it’s your specific tool, X is better!” and I wouldn’t argue. The point is, though, that my experience with dependency management is pretty much the same as in any other language I’ve come across. As an everyday user, you only need to know how to download, update, add or remove dependencies, and you’re good to go (pun not intended). I have high hopes for dep to become the one solution that makes Go a modern language from this perspective too (yes, I’m indeed implying it is not right now). 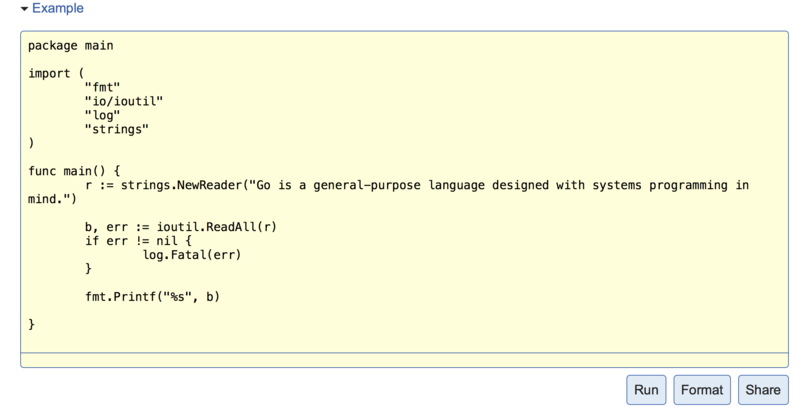 Apart from dependency management, the tooling around Go is pretty awesome. The official toolchain offers a coherent command line experience (coherent is better than consistent when it comes to interaction, but developers seem to like the latter more. Sorry, I digress). I’m happy I don’t have to bother with styling (gofmt is so good), I like even more that testing is part of the official toolchain. The Go community builds a lot of useful tooling, so to keep it short, I will discuss only the ones I use every day for deloominator. The first on the list is gometalinter, a nice tool that runs many linters and normalizes their output. I use it in all my Go projects because it takes care of the boring parts (like installing the linters I use) and makes setting up new linters a 1-minute process. Another nice tool is go-bindata, a small utility that generates Go code to embed files from a disk in the output binary. I’m using it to embed the React application into the binary, it’s easy to use. Unfortunately, it seems completely abandoned right now, so I’m looking for a replacement. Interesting note: it’s been working fine for almost two years after the last commit. Stability is a priority in the Go world and I appreciate it a lot. Last but not least, I love how well-integrated the Go tooling in Visual Studio Code is. The editor supports Go officially and the editing experience is enjoyable. It’s worth underlining that most features are built upon tooling you can use in other editors; most features come from CLI applications (gocode or gomodifytags are great examples). Tooling makes for half of the workflow experience, the other half is language features. When I started using Go, I found a mix of very high-level constructs (like select, go and go routines) and low-level ones (like pointers, structs) confusing. After a while though, I started seeing an interesting development in my way of thinking about code. I was more relaxed about naming and structural organization of different parts. Go makes it easy for me to remove things, to restructure big chucks of code or just to change them. A few factors make a difference: very few language features make the code always easy to read, a strange mix of high-level and low-level constructs gives me enough power without too much responsibility for the underlining system, and the ability of writing very solid integration tests makes refactoring a confident process. This workflow is the most relaxed I experienced so far. When discussing Go features, I like to say: I came to Go for the go keywords and channels, I stayed because of interfaces and a lack of features. The workflow experience helps to start new projects too. To me, starting a new project means writing some code so I can understand the problem I’m trying to solve better. There’s a lot of cognitive load, because it’s an uncharted territory: I have to think hard about naming and about dependencies between parts. The workflow experience with Go makes bootstrapping easier on average. But there’s more: the compiler is super annoying (in a good way), and I have to check all the errors before I can even run the program once. The frustration of writing if err != nil all over the place is at the core of one of my favorite features: the distinction between errors and exceptions. It forces me to think about things I can choose to ignore while bootstrapping a project in other languages: the file may not be there, the network connection may fail, and so on. Unfortunately, it is indeed annoying to write a lot of if err != nil, so I guess people often do not get past the initial impact. And they never experience that “Go programs are production ready as soon as they compile”. Sometimes, that’s really true. It’s hard to talk about Go features without talking about generics. deloominator supports multiple databases, which often made me think about the argument “we don’t need generics”. I would find writing different dialects’ code easier to organize if the language had generics, but the more I think about it, the more I’m convinced it’s because of a habit. I ran into the feeling “oh I really wish Go had generics” often in the past, and the answer way too often was that my code did not embrace Go interfaces. Now I think there’s a middle ground between “we don’t need generics” and “let’s do what Java does”. I agree we have not found the answer yet, but I do hope that if we ever get generics, they will feel like Go interfaces. deloominator has only a few endpoints and http has almost everything I needed so far. I only needed goji for registering endpoints under a specific pattern. httptest provides a response recorder that makes testing HTTP handlers easy and fun. It gives me great confidence, because I can assert behavior over the actual response output; I do not mock anything. Despite using a small ORM for the internal storage, I’m satisfied with sql. It feels low-level compared to any other library I’ve used (I did mostly Ruby. And Ruby has Sequel – an incredible library that deservers its own article). Despite the low-level feeling, the package is well-designed and easy to use. The package provides some layouts, and if you’re lucky enough, the format you want is there then parsing dates is OK. The experience gets considerably worse if you need a custom layout. As a result “some random date” ends up in your code as a constant. I’m not entirely sure what the reason to diverge so much from the usual “give me a pattern and I’ll try to parse this for you” was, but the experience has not been pleasant so far. If I felt more comfortable with the official issue tracker (more about this in the “community” paragraph), I would propose to change the package a lot for the upcoming Go 2. Libraries and framework are among the most relevant factors that determine my choice of a language. I feel “there’s a good library for everything” nowadays, as the community is large enough. One aspect I find interesting is that, despite the lack of dependency management tools, working with third-party libraries isn’t a nightmare anyway. The ecosystem is dynamic and moves slow (it’s a good thing), so upgrading libraries has always been easy despite the lack of official tooling. They all have one thing in common: they are rock-solid and well-documented. It sums up nicely how I feel about the entire ecosystem. I’ve rarely run into libraries with missing documentation or strange behavior. This is the sore point of my experience with Go. I’ve been thinking a lot about how to approach the topic. The first strategy I came up with was to present a (sadly long) list of examples of “culture that makes me uncomfortable”. I decided against it, because as a reader of that list, I’d feel the writer just wanted to call people out. That is not my intention, I want to share how I experience the community, so I will do that without sharing links. I like self-hosting languages, so I moved on to issues anyway. But it has not been a better experience. I’ve often felt people tried to be clever more than helpful, and I have seen incredible resistance to change. I do understand changing a programming language is no easy business, but in some cases it really felt unreasonable. What I’m trying to say is that I do not feel welcome to ever open an issue, because I expect it will be dismissed right away.